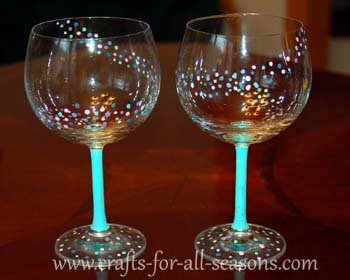 These painted wine glasses are an easy and classy way to dress up inexpensive clear wine or champagne flutes for your New Year's Eve party! 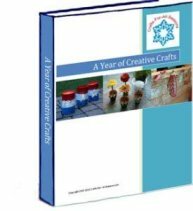 Holiday craft ideas such as this will make your next party stand out. These also make a wonderful host/hostess gift to bring if you are attending a party. Anyone can do it, just follow the step by step instructions below. 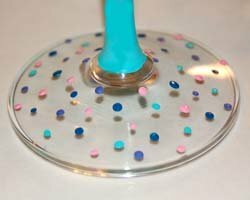 This technique can also be used to decorate the disposable plastic wine or champagne glasses if you use those at your party. 1. Enamel paints can be found at your local craft store in little 2 oz bottles. They sometimes are maked with an "E" on the lid. 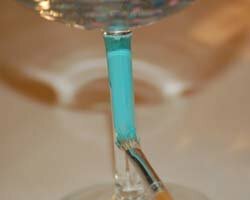 Make sure you are choosing enamel paint, which bonds better with the glass, and not acrylic. Acrylic paint rubs off more easily. 2. Begin by cleaning the glasses well. A little bit of rubbing alcohol rubbed on the outside of the glass will ensure a nice, clean surface. 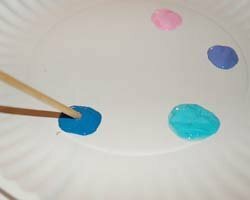 Begin by dipping the other end of the paint brush into one color of paint. 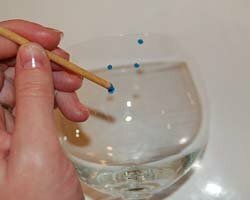 Then, use this to make perfect little dots on the glass. 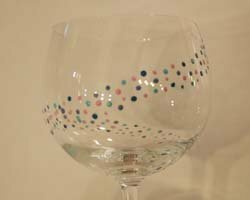 Begin to paint an inch wide swirl that will run down the length of the glass, and around, as shown in the photos. 3. Next, change colors. Add more dots in between the ones you just made. Continue with as many colors as you choose. I did four colors, blue, aqua, purple, and pink. 4. 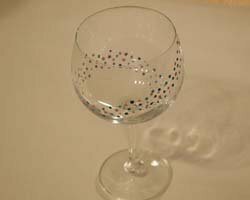 If you want, continue decorating by painting the stem of the glass, and/or add more dots to the base of the wine glass. 5. Allow to dry well. 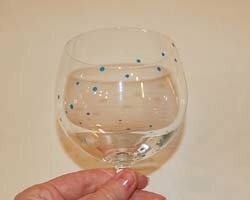 These wine glasses will last longer if they are hand washed after use. Enjoy!